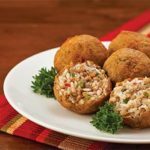 Big Easy Foods Crawfish Boudin, large plump crawfish tails mixed together with tomatoes, onions, green onions, bell peppers, and a special blend of pork, rice and secret cajun seasoning. 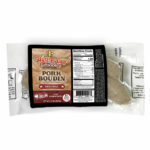 Cooking Directions Stove top Cooking Instructions: Place thawed boudin link in enough simmering water to cover. Simmer for 10 minutes. Remove link from water and allow to cool for 2 to 3 minutes before cutting. 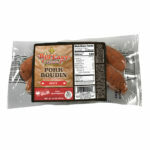 Microwave Cooking Instructions: Place boudin link on a plate and cook on high for 1 to 2 minutes. Rotate 1/2 turn after half the cooking time. Allow to cool 2 to 3 minutes before cutting.